Speakers at the conference, "Paradigm Change in Pentateuchal Research," from left to right: Lina Petersen, Eckart Otto, Benjamin Kilchör, Jan Retso, Fr. 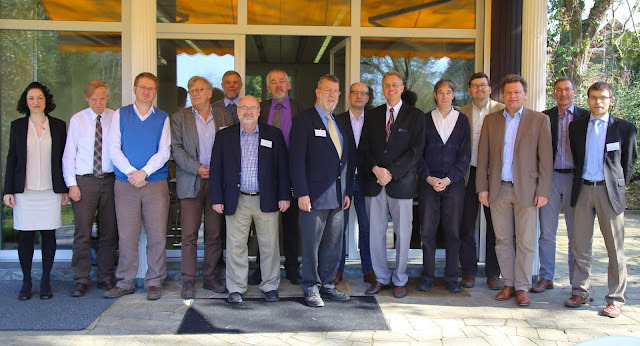 Georg Fischer SJ, Richard Averbeck, Carsten Vang, Joshua Berman, Koert van Bekkum, John Bergsma, Markus Zehnder, Pekka Pitkännen, Mattias Armgardt, Guido Pfeiffer, Kenneth Bergland. Sandra Richter participated via teleconferencing. The international conference "Paradigm Change in Pentateuchal Research" held this past week (March 16-18) at the Staatsunabhängige Theologische Hochschule Basel (State-Independent Theological College of Basel) was a stunning success. Bringing together scholars in Pentateuch and cognate fields (History of Law, ANE Linguistics) from around the world, the conference explored ways of interpreting the Pentateuch apart from the now-discredited Wellhausenian paradigm. Studies in biblical intertextuality, linguistics, source criticism, hermeneutics, and the history of ANE societies tended to converge, making it possible to understand the Pentateuch as a more coherent document from an earlier period in Israel's history than has been commonly recognized in the Wellhausenian tradition and its derivatives. Highlights were comprehensive critiques of Pentateuchal criticism as usually practiced from Georg Fischer and Richard Averbeck, a remarkable dialogue between Eckart Otto and Benjamin Kilchör on the relative dating of Deuteronomy and the Priestly materials; and innovative presentations from Lina Peterson and Sandra Richter on the historical development of Israel's language and economy, respectively, and the implications for Pentateuchal composition. Congratulations John! This looks fantastic. Can't wait to hear about it person. This is very encouraging. Where would a person look for forthcoming articles on this conference?